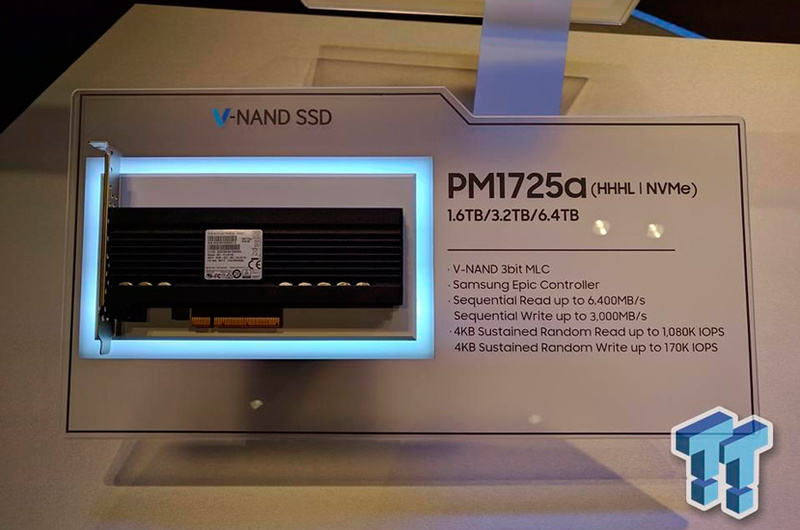 This impressive SSD from Samsung makes use of its 3D V-NAND MLC type memories with 3 bits per cell along with Samsung’s Epic controller and a PCIe 3.0 x8 port that lets it to achieve sequential read speeds of an astonishing 6,400 MB/s and a writing speed of 3,000 MB/s. Its random access speeds are also impressive, with numbers like 1,080,000 read IOPS and 170,000 write IOPS, which makes it one of the fastest SSD in the world. To achieve these speeds, the Samsung PM1725a makes use of the NVMe technology on a card with a PCIe 3.0 x8 interface, in fact, we’re talking about transfers rates so high that a PCIe 3.0 x4 connector would fall short by a lot. In fact, the same SSD model in its 2.5” format achieves “just” 3,300 MB/s and 2,900 MB/s of read/write speeds because of limitations of the U2 connector via PCle x4 with its 3.94GB/s bandwidth. Unfortunately, it is a SSD designed for the professional market, so it will be quite difficult and expensive to purchase for home use. It will come in capacities of 1.6TB, 3.2TB and 6.4TB in the aforementioned formats of 2.5 ” and in hhhl with a PCIe 3.0 x8 interface. Next What’s the Difference Between WiFi 2,4 GHz and 5 GHz? My data center is testing them in 800GB sizes, so just a FYI on capacity availability.